Benghazi. Few words have become more politicized in the last decade than this one, the Libyan city where, on September 11, 2012, two U.S. diplomatic compounds were sacked and four men (including Ambassador Chris Stevens) killed. It became a political football kicked back and forth during the 2012 campaign and for years after. It’s to the credit of director Michael Bay that he largely succeeds in removing politics from the equation. 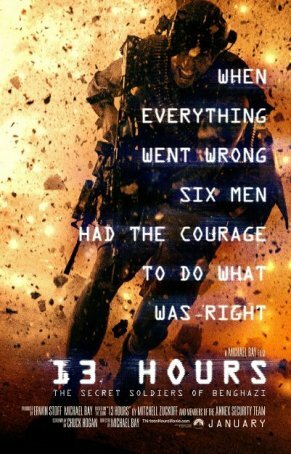 13 Hours: The Secret Soldiers of Benghazi is unquestionably jingoistic and will incite patriotic fervor among some but it doesn’t play the blame game. Instead, it’s an old fashioned war movie of the sort John Wayne (and his like) used to make: a good guys vs. bad guys shoot-’em-up (although updated with the kinds of pyrotechnics that Bay loves to film). The movie is imperfect and overlong but it’s never boring. And, although aspects of its factual accuracy can be called into question, it does a decent job of chronicling what happened that night. 13 Hours focuses on the events of September 11-12 and, in particular, how they impacted a six-man team of military contractors working for the CIA: Jack (John Krasinski), Rone (James Badge Dale), Tanto (Pablo Schreiber), Boon (Dave Denman), Tig (Dominic Fumusa), and Oz (Max Martini). Events unfold in several acts, each featuring mayhem and death. The film’s first half provides background information (delivered in typical Bay rapid-fire fashion) and details the attack on the main compound. The second half focuses on the Alamo-like defense of the second compound as it comes under attack by three waves of militants. It’s cowboys and Indians, except the location is Africa and the participants have machine guns, mortars, and rocket launchers instead of rifles and bows. Although some of the gun battles are protracted, this kind of story plays to Bay’s strengths as a filmmaker. Character development is kept to a minimum (and, on those occasions when it happens, it does so with cringe-worthy dialogue and/or flashbacks). The director is a master of brewing adrenaline-and-testosterone cocktails and that’s what he does here. The film bubbles with tension and excitement and there’s never any doubt about the identities of the good guys (the American ex-soldiers) and the bad guys (Libyan extremists). The one character existing in the gray is Bob (Dave Costabile), the weaselly CIA honcho whose goals don’t align with those more interested in saving lives rather than going by-the-book. Bay doesn’t deal in subtlety and nothing of the sort is attempted in 13 Hours. This is a straightforward action-thriller that never pretends to be anything other than what it is. Its strong strain of American patriotism may make it a hard sell beyond these shores. The chaos that arises during the prolonged battle sequences leads to a sense of disorientation. Bay’s intention is to immerse the viewer in the experience and, to a degree, this works. Unfortunately, it also makes it difficult at times to figure out what’s happening. At one point, I was uncertain who had just died. And, although Bay tries to use maps to establish geography, they are presented too quickly for the viewer to process them. The lack of spatial clarity feeds into the confusion that arises at times during the battles. One problem with 13 Hours is character differentiation. With the exception of Jack, who is given the most fully realized background, there is a sameness among the protagonists. The only way we’re able to tell them apart is that they look different. But they’re all essentially the same person: the macho ex-soldier who has left behind a family to hang out with his brothers in a hellhole half a world away from home. John Krasinski, despite being known primarily for his comedic work in the TV series “The Office”, gives a respectable dramatic performance here, coming close to making Jack a fully realized human being. No one else accomplishes anything similar. Although the on-screen content of 13 Hours steers clear of the Benghazi political firestorm, that won’t keep the film from being dragged into the fray. However, by keeping the perspective limited to those who are on-site, the movie avoids thorny questions about upper-level negligence, incompetence, and indifference. There’s no questioning that this is a Bay movie. The director’s DNA is burned into every frame: it’s loud, long, and chaotic, but it’s also entertaining when accepted on its own terms. The film is targeting the American Sniper crowd but comes to the party with the existential and philosophical questions stripped away. It’s a very different experience that stands in stark contrast to the wave of “revisionist” war movies that have become the norm in recent years. 13 Hours is a triumph of the “traditional” (pre-1970s) school with a whole lotta explosions thrown into the mix.